Pope Urban VII (4 August, 1521 – 27 September, 1590), born Giovanni Battista Castagna, was Pope for thirteen days in September 1590. He was of Genoese origin, although born in Rome. He was created Cardinal-Priest of S. Marcello in 1584. He was chosen successor of Pope Sixtus V (1585–90) on September 15, 1590, but died of malaria (27 September, 1590) before consecration, making his either the shortest or second shortest papal reign in history, depending on whether Pope-elect Stephen is considered a real pope (he has not been so considered by the Catholic Church since 1961). Giambattista Castagna, born at Rome, 4 Aug., 1521; elected pope, 15 September, 1590; died at Rome, 27 September, 1590. His father, Cosimo, was a Genoese nobleman; his mother, Costanza Ricci, was a Roman and sister of Cardinal Jacovazzi. He studied civil and canon law at various universities of Italy and graduated as doctor of both laws at Bologna. Soon after he became auditor of his uncle, Cardinal Girolamo Verallo, whom he accompanied as datary on a papal legation to France. On his return to Italy, Julius III made him referendary of the Segnatura di Giustizia and on 1 March, 1553, appointed him Archbishop of Rossano. He was ordained priest 30 March, and consecrated bishop by Cardinal Verallo, 4 April. Julius III sent him as governor to Fano in 1555, and under Paul IV he was for a short time Governor of Perugia and Umbria. During the reign of Pius IV he settled satisfactorily a long-standing boundary dispute between the inhabitants of Terni and Spoleto. From 1562 to 1563 he assisted at the Council of Trent, where he was made president of various congregations and manifested great prudence and learning. In 1565 he accompained the cardinal-legate Buoncompagni (afterwards Gregory XIII) to Spain, where he remained seven years as papal nuncio at the Court of Philip II. On his return to Italy he voluntarily resigned the archiepiscopal See of Rossano in January, 1573, and was sent by Gregory XIII as nuncio to Venice, whence he was transferred as governor to Bologna in 1577. A year later he was sent as legate extraordinary to Cologne, to represent Gregory XIII at the peace conference between Philip II and the United Provinces. Upon his return to Rome he was appointed Consultor of the Holy Office and the Ecclesiastical State. On 12 December, 1583, Gregory XIII created him cardinal priest with the titular Church of S. Marcello, and on 8 October, 1584, appointed him legate of Bologna. During the reign of Sixtus V (1585-90) he was highly influential. On 19 November, 1586, he became Inquisitor-General of the Holy Office. Sixtus V having died 27 August, 1590, the cardinals, 54 in number, entered the conclave at the Vatican on 7 September, and elected Cardinal Castagna as pope on 15 September. The news of his election was a cause of universal joy. The new pontiff was not only highly esteemed for his piety and learning, he had also, in the many important and difficult positions which he filled as archbishop and cardinal, manifested extraordinary prudence and administrative ability. He chose the name Urban in order that this name, which in Latin signifies "kind", might be a continuous reminder to him to show kindness towards all his subjects. One of his first acts was to have a list made of all the poor in Rome that he might alleviate their needs. He also gave liberal alms to those cardinals whose income was insufficient, paid the debts of all the monts-de-piété in the Ecclesiastical State, and ordered the bakers of Rome to make larger loaves of bread and sell them cheaper, indemnifying their losses out of his own purse. Desirous of checking the luxury of the rich, he forbade his chamberlains to wear silk garments. In order to give occupation to the poor, he ordered the completion of the public works that had been commenced by his predecessor. He appointed a committee of cardinals, consisting of Paleotti, Fachinetti, Lancelotti, and Aldobrandini, for the reform of the Apostolic Datary. Strongly opposed to nepotism, he expressed his purpose never to appoint any of his relatives to an office in the Curia and forbade them to make use of the title "Excellence", which it was customary to give the nearest relatives of the pope. A few days after his election he became seriously ill. The faithful united in prayers for his recovery; public processions, expositions of the Blessed Sacrament, and other pious exercises were conducted. The pope confessed and communicated every day of his illness. He once expressed a desire to remove to the Quirinal, where the air was purer and more wholesome, but, when told that it was not customary for the pope to be seen in the city before his coronation, he remained in the Vatican. He died before the papal coronation could take place and was buried in the Vatican Basilica. On 22 September, 1606, his remains were transferred to the Church of S. Maria sopra Minerva, where a magnificent monument was erected in his honour. His temporal possessions, consisting of 30,000 scudi, he bequeathed to the Archconfraternity of the Annunciation to be used as dowries for poor girls. Urban VII, given name Giovanni Battista Castagna, successor of Pope Sixtus V, was born on the 4th of August 1521. He became governor of Bologna, Archbishop of Rossano, and was long nuncio to Spain. 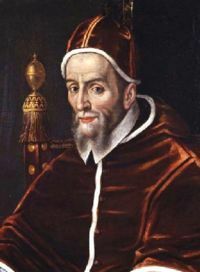 Pope Gregory XIII made him a cardinal, 1583; and in 1590 he was elected pope by the Spanish faction, but died twelve days later, on the 27th of September 1590, and was succeeded by Pope Gregory XIV.